llegal immigration this year is expected to hit the highest level in a decade, reaching numbers that the United States has not seen since President George W. Bush. 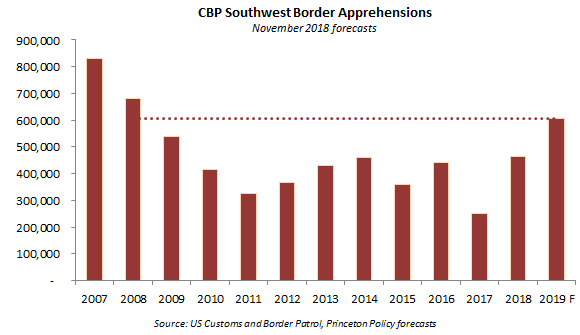 In December 2018, the last month for illegal border crossing totals, there were close to 51,000 border crossings at the U.S.-Mexico border, a level that outpaced Princeton Policy researcher Steven Kopits’ monthly projection by about 3.5 percent. The month before, there were nearly 52,000 border crossings. Based on the latest available data, Kopits projects there to be about 606,000 crossings this year at the U.S.-Mexico border, a level of illegal immigration that surpasses nearly every year of illegal immigration under President Obama. hould illegal immigration to the U.S. keep pace with Kopits’ projections of more than 600,000 border crossings this year, this would be double what illegal immigration levels were in Fiscal Year 2017, Trump’s first year in office. Additionally, this would represent an increase of illegal immigration at the southern border between 2017 and this year of more than 99 percent. Illegal immigration under Trump has been skyrocketing since his first year in office. For example, for the calendar year 2018, illegal immigration levels at the U.S.-Mexico border hit about 465,600 crossings. This was a level of illegal immigration not seen since Obama’s Fiscal Year 2014 border crossing totals, when about 480,000 foreign nationals were apprehended at the border. Aside from overwhelming already strained Border Patrol and Immigration and Customs Enforcement (ICE) resources, illegal immigration hits the country’s working and middle class the hardest, as they are left paying an annual bill of about $116 billion to subsidize the cost of illegal aliens. Mass illegal and legal immigration adversely diminishes wages and job prospects for American workers, especially black Americans who are more likely to compete for U.S. jobs against cheaper, foreign workers. 600,000 they catch. God only knows how many they don't catch.